If you want to shoot a big buck, you need to get them onto your property. Lure ’em on with Big & J BB2 Long Range Attractant. In this era of food plots and property management, deer will choose to go to the setup that’s best. BB2 is your secret weapon. 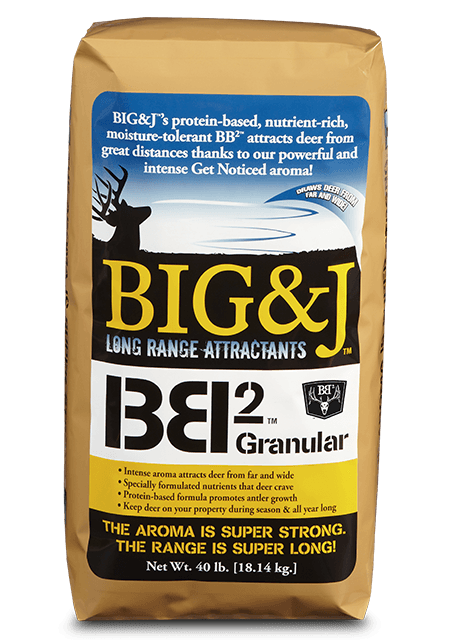 Big & J Long Range Attractant, BB2 Granular, features a powerful and intense get-noticed aroma that draws deer from far and wide. This natural long-range aroma is the by-product of the proprietary refining process. No artificial ingredients or flavors are added. It’s so long range that even humans can smell it from a relatively long distance. Pick up Big & J BB2 Long Range Attractants and all your hunting supplies at J&N Feed and Seed in Graham, Texas.